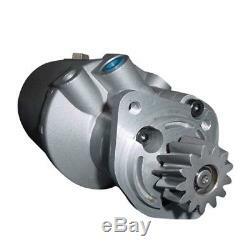 Power Steering Pump for Massey Ferguson Tractor 165 255; 3165; 40; 50; 523090M91. Americas Tractor Parts Specialist Complete Tractor is in the business of keeping tractors moving forward in the field. Our mission is to offer one of the most extensive collections of both common and hard-to-find tractor parts available anywhere. We dont want to see a single tractor sit idle on the sidelines when it could be out in the field. Many people are amazed at how they can still find parts for some tractors that have been out of production for years or even decades. We carry parts for the following tractor brands and more: John Deere, Massey Ferguson, Ford New Holland, Case IH, Kubota, A-C, Gehl, JCB, Long, Komatsu, Yanmar and Hesston. The Quality You Expect at a Pleasingly Low Price Combining value and quality, Complete Tractor is a go-to source for tractors owners in all 50 states and outside of the U. Our aftermarket parts meet OEM specifications for reliable performance, while often costing substantially less than OEM counterparts. Is this the right part? Please verify this is the right part number before ordering. Check our fitment list below and make sure that your tractors model number is listed. 165; 255; 3165; 40; 50; 65. Unless otherwise specified in the item listing on our website, on the receipt or packing slip, or in the following terms, Complete Tractor will accept qualified and conforming products for replacement for the period of 1 (one) year. Products must be in Like New condition and free from damage of any type, including, but not limited to dents, scratches, cracks, abuse, defacement or indication of removed screws/fasteners or seals. Complete Tractor shall not be held liable for packages lost in transit. The customer may use this label to return the item to Complete Tractor free of charge. After the item is received by Complete Tractor for processing, Complete Tractor will send out a replacement unit. If you have a problem, we will take every step to assist you. The item "Power Steering Pump for Massey Ferguson Tractor 165 255 3165 40 50 523090M91" is in sale since Tuesday, July 11, 2017. This item is in the category "Business & Industrial\Heavy Equipment, Parts & Attachments\Heavy Equipment Parts & Accessories\Tractor Parts". The seller is "completetractor" and is located in AR, CA, FL, IA, MA, MI, MN, OH, PA, TN. This item can be shipped worldwide.